According to Koen a new highest price of N$ 41.86 per kg was paid on an Agra auction for tollies in January. “Livestock producers who have cattle that are ready to market, should preferably sell them as soon as possible to make use of the good prices. We have no certainty as to how long the prices will remain this strong,” he added. “Despite the fact that high prices for weaners have now been paid for almost a year, we can still not forecast what will happen in the near future. Agra often tries to speculate what could happen in the coming year, just to realize that it is virtually impossible to predict price trends on auctions,” Koen said. According to Koen, the main reasons why weaner prices have risen sharply, are due to a shortage of cattle in South Africa due to recent droughts, as well as the lower maize price, which holds a significant cost benefit for feedlots. “The other reason is that South Africa, previously a net importer of meat, has now become a netto exporter of meat after the country successfully marketed its meat overseas. The largest part of Namibian weaners are currently being exported to South-African feedlots,” he added. Koen said maize, or feed, is the main expenditure of a feedlot. “The maize price dropped below N$ 2000 a ton after South Africa produced a record maize yield last year. The local price for weaners is strongly linked to the South-African maize price. If it stays stable, chances are that the weaning calf price will remain stable. However, if it fluctuates or becomes more expensive, the weaning price will definitely decrease,” said Koen. He said a significant rise in weaner prices in the industry were predicted, but this sharp rise during the previous year was definitely higher than expected. “Following discussions between Agra and South-African feedlots middle last year, a consensus was reached that the high auction prices would not stay at these levels for a long time. However, the contrary was the case when prices increased even more. So far, these high prices have been maintained,” he concluded.. 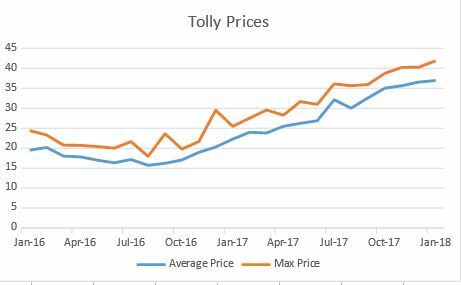 According to statistics of auction prices kept by Agra, the average price paid for tollies in June 2016 stood at a low of N$ 15.70 per kg. By January this year it increased to N$ 36.94 per kg – which means more than double the price of June 2016 is currently being paid.